‘Mamath Eka Malak’ is the FIRST Sinhala autism song for 2014 marking Autism Sunday 2014 from the Commonwealth of Nations. The Daily Mirror newspaper in Sri Lanka published a major feature on Sri Lankan music star Rukshan Karunanayake releasing his moving song ‘Mamath Eka Malak’ for Autism Sunday 2014 – this global event was held on Sunday 9th February 2014. There were also tweets on the Autism Sunday Twitter Storm held on the same day using the hashtag #autismsunday. Rukshan Karunanayake was awarded the GLOBAL AUTISM AWARD for releasing the song ‘Mamath Eka Malk’ in order to raise awareness of the condition in Sri Lanka. 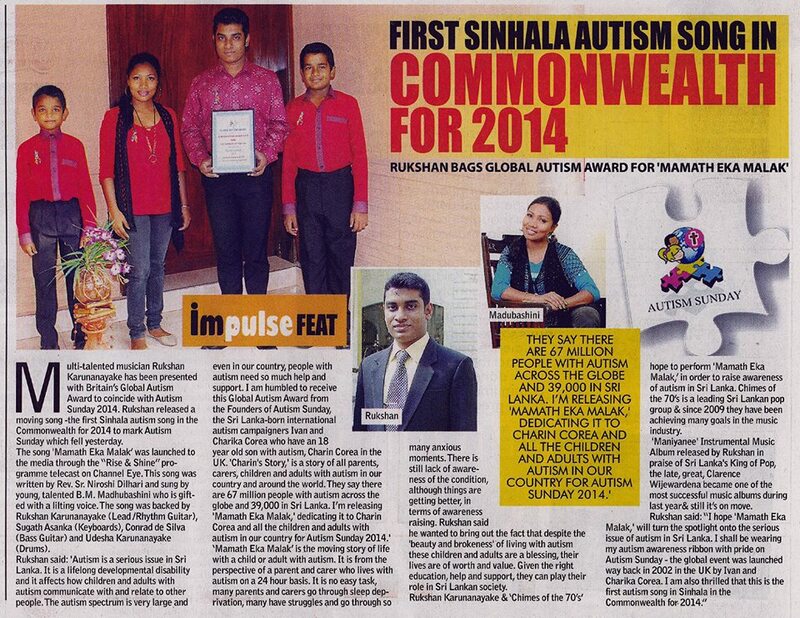 The major news feature in the Daily Mirror in Sri Lanka on Rukshan Karunanayake’s ‘Mamath Eka Malak’ the Sinhala autism song released for Autism Sunday 2014. 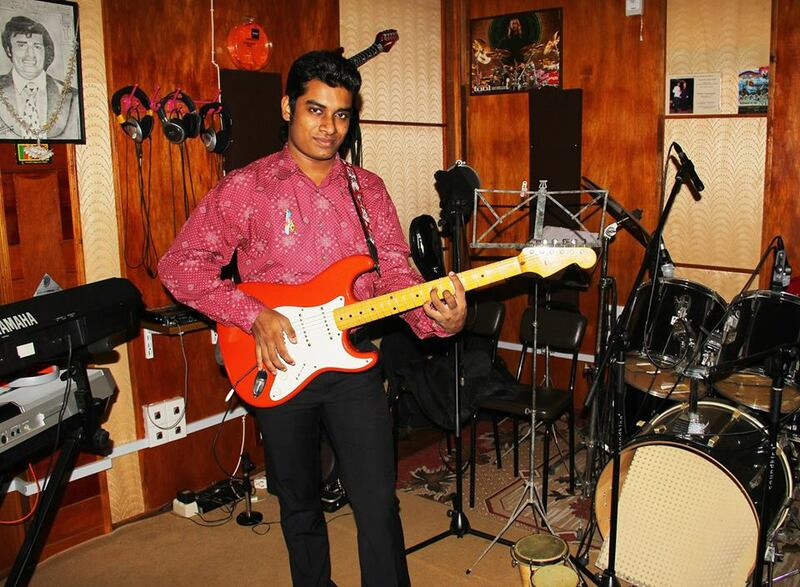 Sri Lankan star Rukshan Karunanayake has won high praise for releasing an autism song to raise awareness of the condition. Rukshan has dedicated ‘Mamath Eka Malk’ to Vernon Corea’s grandson, Charin Corea and all parents, carers, children and adults with autism in Sri Lanka. This entry was posted in Daily Mirror Sri Lanka on Rukshan's 'Mamath Eka Malak' and tagged 000 people with autism in Sri Lanka, 39, Autism in Sri Lanka, Autism in the Commonwealth, Autism Sunday, Autism Sunday 2014, Chimes of the 70s, Daily Mirror Sri Lanka on Rukshan's 'Mamath Eka Malak', First Sinhala Autism Song in the Commonwealth for 2014, Global Autism Award, historic Sinhala Autism Song by Rukshan Karunanayake, Major feature in the Daily Mirror Sri Lanka on Rukshan Karunanayake's Autism Song, Rukshan dedicates Autism Song to Charin Corea, Rukshan Karunanayake, Rukshan Karunanayake Bags Global Autism Award, Rukshan Karunanayake releases Mamath Eka Malak for Autism Sunday 2014, The Commonwealth of Nations, The global event. Bookmark the permalink.